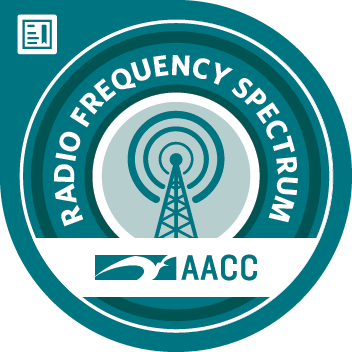 OCA 559 Radio Frequency Spectrum Management is a comprehensive course that will provide high-level fluency, competency and problem-solving techniques required in spectrum management. Spectrum-related topics will allow students to interrelate the legal, regulatory, technical and economic aspects that aid in the decision making process involved in spectrum management. Demonstrated a fluency in important terms and definitions and spectrum management fundamentals. Demonstrated a fluency in the organization and spectrum regulations of international treaty and U. S. regulatory agencies. Demonstrated a fluency using the table of frequency allocations. Demonstrated a fluency in how spectrum is allocated and frequencies allotted. Demonstrated a fluency assignment and licensing procedures. Demonstrated a fluency in equipment approval processes and systems certifications. Demonstrated a fluency in spectrum mathematics. Demonstrated a fluency in radiowave propagation. Demonstrated a fluency in antennas for spectrum managers. Demonstrated a fluency in technical standards. Demonstrated a fluency in spectrum efficiency. Demonstrated a fluency in fees and auctions. Demonstrated a fluency in spectrum sharing techniques and current "hot" topics.